Asian tech giants are scrabbling to join the autonomous car race. A pair of new announcements reveal that Baidu has successfully tested a self-driving BMW in China, while Samsung has decided to begin producing components for use in autonomous vehicles. 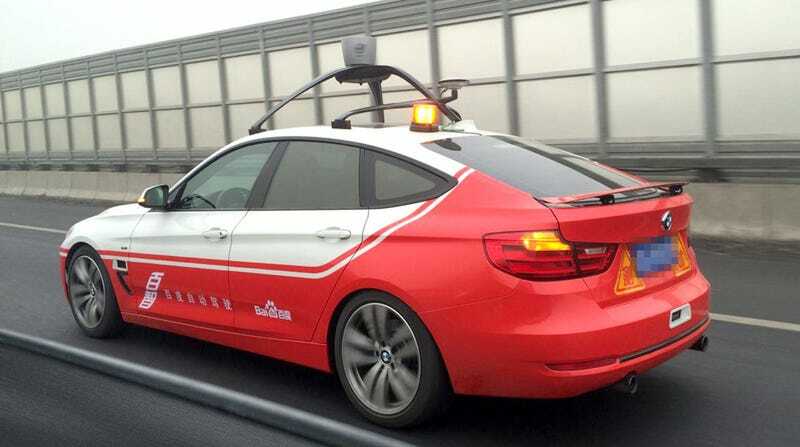 Speaking to the Wall Street Journal, Wang Jing, a Baidu senior vice president, explained that the search company has built two prototype BMW 3 Series Gran Turismo autonomous cars. Much like Google’s efforts, the vehicles use Lidar and other sensors to see their surroundings, with highly detailed prior maps and deep-learning software being used to make sense of the data and actually control the car’s motion. They’ve so far been tested on expressways in northern Beijing, “hundreds of times, with several trips each day,” hitting speeds of 60 mph. The long-term goal, according to Jing, is to develop the autonomous vehicles for use as public shuttles, though the details of how that might work remain unclear. Elsewhere, Samsung has announced that it’s creating a new division to manufacture kit for cars. According to Reuters, it’ll focus on “in-car entertainment, satellite navigation and autonomous driving technologies.” There aren’t too many more details, but it’s in good company—LG, also based in South Korea, is working on car components too.